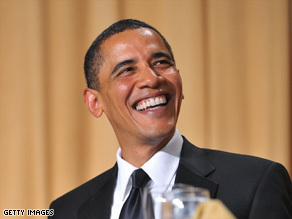 President jokes Republican Party "does not qualify for a bailout"
WASHINGTON (CNN) -- President Barack Obama isn't afraid to laugh at himself. In fact, he appears to revel in it. President Obama delivers some one-liners at the White House Correspondents' Association dinner. His turn at the annual White House Correspondents' Association dinner Saturday spared no one -- not even his own administration. "I would like to talk about what my administration plans to achieve in the next 100 days," Obama said. "During the second 100 days, we will design, build and open a library dedicated to my first 100 days." He added later, "I believe that my next 100 days will be so successful, I will be able to complete them in 72 days -- and on the 73rd day I will rest." Obama touched on a few gaffes during his short time in office, from Vice President Joe Biden's verbose tendencies to an unfortunate Air Force One photo op that frightened New Yorkers -- playfully pointing his finger at his young daughters. "We had been rivals during the campaign, but these days we could not be closer," the president said. "In fact, the second she got back from Mexico, she pulled me into a hug and gave me a big kiss -- told me to get down there myself." "Across the country, there are extraordinary, hardworking journalists who have lost their jobs in recent days, recent weeks, recent months," he said. "I know each newspaper and media outlet is wrestling with how to respond with these changes. ... Not every ending will be a happy one. "It is also true that your ultimate success as an industry is essential to the success of our democracy -- it's what makes this thing work," Obama said.